A demonstration in front of Sierra Tower was organized on Thursday to inform people in the community about what is occurring in the nation in regards to the executive orders put in place by President Trump. 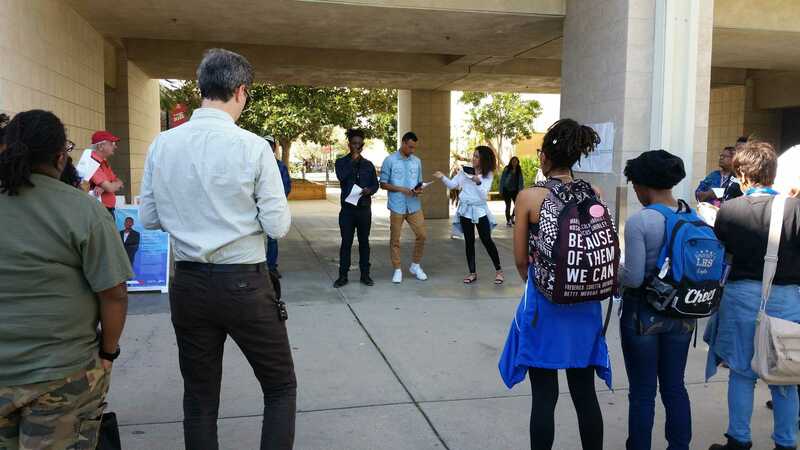 The NAACP held the demonstration as a way for people to have a safe space in order to talk about how they feel about the current political climate. The members passed out a flyer stating all the executive orders that would impact the community for the better or for the worse. They mentioned the border wall, approving the pipeline, defeating ISIS and reviewing Wall Street regulations. Ariel Thomas, a 25-year-old cinema and television arts major, came to support the NAACP. The NAACP at CSUN holds meetings that everyone is invited to in order to talk about all about underrepresented issues in the community. According to Johns, the whole point of the demonstration was to reassure people that there are places where voices are being heard and that others are listening to them. The NAACP at CSUN wants to include everyone and make sure their voices are heard. “We are activists and we want to help people in the community during these hard times,” Johns said.